For the first time in MLB history, a SkyCam system was deployed for actual game coverage — rather than just beauty shots — this week for Fox Sports’ MLB All-Star Game production at Nationals Park. The vast open area in left field and left center field provided an ideal visual environment and also allowed the system to be installed (mounted on the center-field scoreboard and light towers in far left field) so that it would not interfere with action on the field. 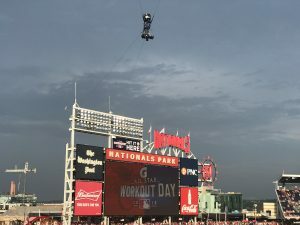 Fox Sports deployed SkyCam for main game coverage at MLB All-Star at Nationals Park. The SkyCam served multiple roles on Tuesday night, providing game coverage; beauty shots of the skyline; reveal shots of Fox’s left-field studio set; shots of the bullpen, player warmups in the outfield, isos, crowd; and more. This was made possible by the four-point system’s ability to traverse not only the X and Y axis but also the Z axis. As a result, the SkyCam system could go 115 ft. high for beauty shots and as low as 10 ft. above the crowd in the stands or 40 ft. above the field during game action. The introduction of SkyCam on MLB-game coverage has been a long time coming. 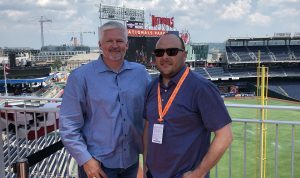 SkyCam was deployed by ESPN at the College World Series in years past and has played a key role in NBC Sports’ productions of NHL Winter Classics held at MLB ballparks, including Nationals Park in 2015. Although Fox deployed a Spidercam system at the 2016 All-Star Game in San Diego, this year marks the first time a point-to-point aerial system has been used for in-game coverage. 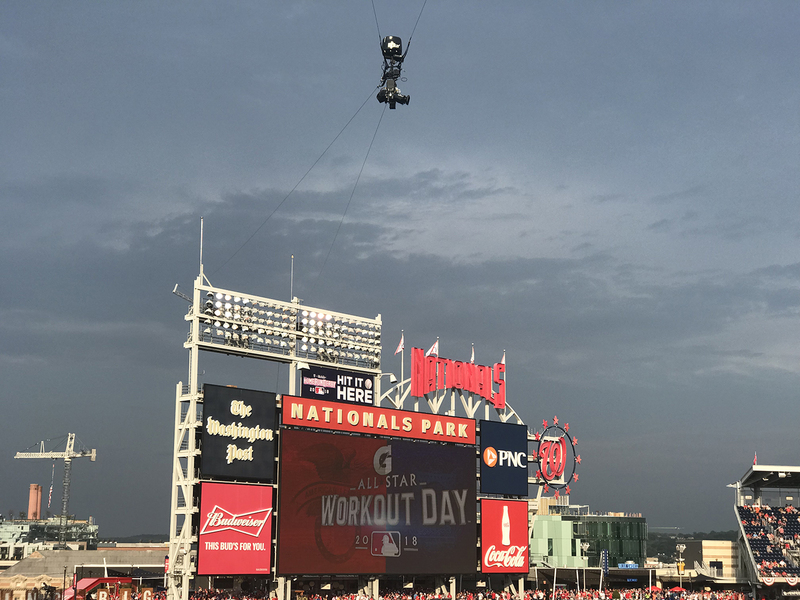 Two years ago, the system was used primarily for commercial bumpers and beauty shots, but the SkyCam system at Nationals Park was also incorporated into the game production.